The Gustie winds have finally made their spring debut, as both yesterday and today have seen sustained winds in the 30 mph range. Up until this week, southern Minnesota had been very spoiled with mostly windless days. Today’s wind is from a southerly direction, but that will change to a northerly direction for a bit over the weekend and into early next week, resulting in some cooler weather with temperatures possibly only reaching the high 50’s on a day or two. But other than tonight and tomorrow, these winds don’t appear to be associated with any precipitation, which means we’re in for another dry week. As the string of unseasonably warm weather has continued, the landscape has progressed so much that it appears almost like it would in early June. While everything looks incredibly green (thanks in part to 0.52 inches of rain over the weekend) and most of the trees have nearly fully leafed out, there are two notable exceptions that can be seen in the arboretum: oaks and ginkgoes. Oaks tend to bud later than most other trees each spring, and even this year most of the oaks are showing just the beginnings of small, new leaves. Similarly, the ginkgoes leaf out at almost the same time each year (first week of May), regardless of the temperature. Additionally, the Kentucky coffeetrees and catalpas on the east side of the Interpretive Center are surprisingly not that far along in their seasonal progressions; these two species, like the oaks and ginkgoes, are late budders every year. 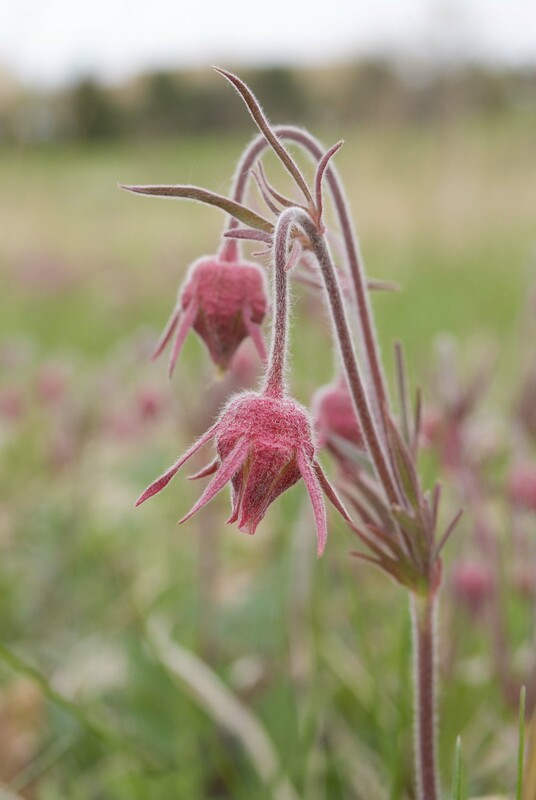 Prairie Smoke blooming near Johnson Prairie Overlook, 4/26/10.